The year is 1945, the aircraft is the Me 262A Schwalbe, and the Luftwaffe was running out of experienced fighter pilots in the defense of Germany. The mission was to draw upon the pool of experienced bomber pilots and transition them into the Me 262 for fighter duty. The training objective was only partially successful, with only KG(J) 54 reaching partial combat readiness and engaging in combat operations before war’s end. A handful of others also entered the fight, but at a significant cost. While combat losses were high, losses to factors other than combat were much higher (accidents, mechanical failures, etc.). The story of Luftwaffe jet reconnaissance operations and aircraft over Czech territory in the final months of the war. Thanks to its superior speed the Me 262 was an idea platform for short-range recce missions and while resources were modest both in terms of pilots and aircraft deployed, the Me 262 reconnaissance force was active right up to the last days of the war, especially over Czech lands. Oblt. Herward Braunegg had been ordered to set up an experimental jet recce unit during the summer of 1944 at Lechfeld leading to the establishment of the first jet recce Gruppe in NAG 6. The first Me 262 recce machines were the interim Me 262A-1a/U3 Behelfsaufklärer, modified from the standard jet fighter, development of which took place at Messerschmitt’s parent factory. The aircraft featured two Rb50/30 cameras in the nose, requiring the installation of small teardrop fairings over the gun access panels, the standard nose armament itself being deleted with a single Mk 108 cannon being retained in some instances and moved to a central position in the nose of the aircraft. Trials took place utilising machines assigned to EJG 2. 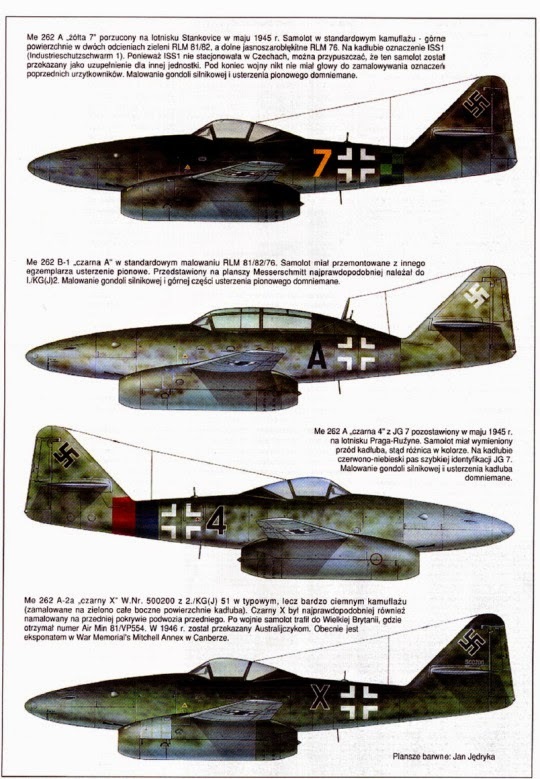 The concept of the ‘new’ ME 262 recce design and then explore the attempts to conceive a reconnaissance variant based on the standard Me 262 fighter. Me 262 production and repair in the Protectorat, the activities of the two main constructors, Heinkel’s FWE (Flugzeugwerke Eger) at Cheb and LBB (Leichtbau Budweis). According to documents from the Gen. Qu. the Luftwaffe took possession of some 33 photo-reconnaissance Me 262As assigned to NAG 6 and NAG 1 which were subsequently re- assigned to III./EJG 2. 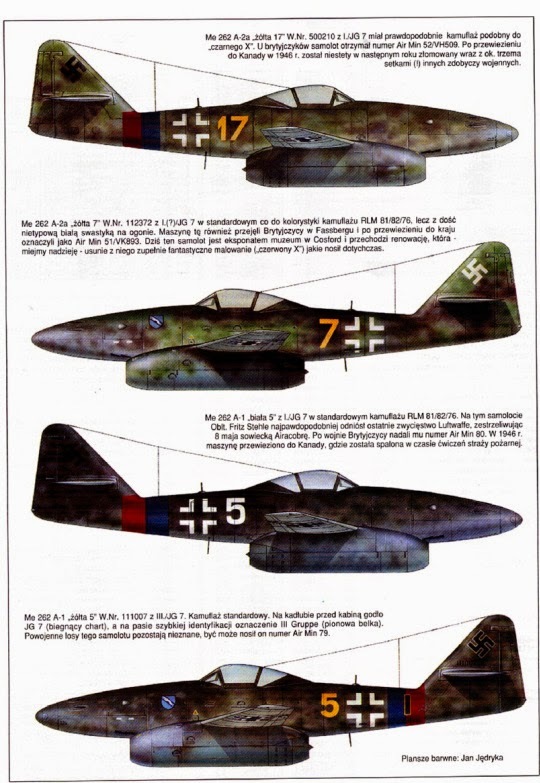 Standard Me 262 A-1a jet fighters assembled by the LBB with five pages devoted to ‘Yellow 3′ of 3./ JG 7. Reconnaissance Me 262s were even deployed in their place of origin. 1./NAG 1 arrived at Cheb on 17 April 1945 but quickly tangled with 9th AF P- 51s and P-47s. “White 5″ of the Stab./ NAG 1 was shot down as it set up for a landing at Cheb and the pilot Ofw. Peter Wilke was killed. By late April 1945 those remaining jet Staffeln still operating had transferred to Prague-Ruzyne and were assimilated into the Gefechtsverband Hogeback. The battle for Prague raged until 7 May 1945 with the Me 262 recce Staffeln operating right to the end. Dispersed production of the Me 262 spread into Bohemia (Czechoslovakia) towards the end of the war with the large Avia aircraft factory producing nose sections and forward fuselages, and other Czech factories producing major parts of the Jumo 004B engine. By the end of the war, Czechoslovakia held a considerable number of unused airframes, engines, and other parts for the Me 262. Looking at this considerable resource, the Czech government decided to complete a number of these aircraft to equip the Czechoslovakian Air Force. The Letecke factory in Malesice began work on assembling the Jumo 004B1 engines, designated M-04 by the Czechs, while the Avia plant resumed its work on the Me 262 by concentrating on 18 suitable wartime airframes. The aircraft was designated S-92 Turbina (the ‘S’ signifying ‘fighter’), and was virtually identical to the Me 262A-l a. Subsequently, three additional aircraft were completed as two-seat CS-92s, nearly identical to the Me 262B-l a.
Avia Chief Test Pilot took the S-92.1 on its first flight on 27 August 1946, but the aircraft was destroyed ten days later in a landing accident. The second S-92 was first flown on 24 September 1946, and one additional aircraft was completed that year. Only a single S-92 was completed in 1947, but it was nevertheless accepted by the Czech Air Force and turned over to the 5th Fighter Flight. The first two-seater, S-92.7 flew in 1948, and all 21 aircraft had been delivered by 1950. Various improvements were proposed by Avia, including using updated BMW 003A turbojets, and strengthening the somewhat fragile nose landing gear. Yugoslavia even considered buying S-92s in 1951. But at the public military review in Letna on 9 May 1951, six S-92s were accompanied by nine Russian Yak-23s, marking the beginning of closer ties to the Soviet Union. Soon afterwards, a license was issued allowing the Czechs to build the MiG-15, and the last production Me 262s would quickly fade into history. The 5th Fighter Flight was disbanded and its aircraft given to various aviation engineering schools around the Republic as teaching aids. Only two examples are known to have survived, S-92(code V-34) and CS-92 (V-3S), both in the VM Aviation and Space Flight Exhibition in Kbeli.